Purify your complexion with the Sanctuary Spa 5 Minute Thermal Charcoal Detox Mask, a self-heating face mask that draws out impurities. The detoxifying formula uses Charcoal to act as a magnet to dirt, pollution and excess oil, unclogging pores to perform the deepest cleanse possible and help to prevent future breakouts. Myrrh Oil works to soothe any irritation, whilst Kaolin Oil sweeps away shine for a mattifying effect. The ultra-nourishing mask washes off easily to leave behind a hydrated, clarified and healthy-looking complexion. Paraben-free. Not tested on animals. Cleanse skin thoroughly and leave skin damp – this is essential for the self-heating zeolite to activate. Massage a thin layer of the mask over face. Enjoy the warming experience & allow to cool naturally while you relax for 5 minutes. Rinse off with warm water or using a cloth. Follow with your favourite Sanctuary Spa facial oil or moisturiser. Use 2-3 times a week. Zeolite, Butylene Glycol, Glycerin, PEG-8, Kaolin, Dimethicone, Prunus Amygdalus Dulcis (Sweet Almond) Oil, Cetyl Alcohol, PEG-150, Cera Alba (Beeswax), Titanium Dioxide, Xanthan Gum, Carbon, Commiphora Myrrha Oil. 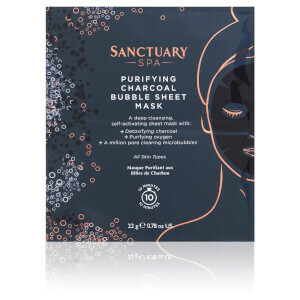 Receive a FREE Sanctuary Spa Charcoal Bubble Sheet Mask when you spend £15 on the brand.